A breathtaking, enchanting new series by debut author Jessica Townsend, about a cursed girl who escapes death and finds herself in a magical world--but is then tested beyond her wildest imagination Morrigan Crow is cursed. Having been born on Eventide, the unluckiest day for any child to be born, she's blamed for all local misfortunes, from hailstorms to heart attacks--and, worst of all, the curse means that Morrigan is doomed to die at midnight on her eleventh birthday. But as Morrigan awaits her fate, a strange and remarkable man named Jupiter North appears. Chased by black-smoke hounds and shadowy hunters on horseback, he whisks her away into the safety of a secret, magical city called Nevermoor. It's then that Morrigan discovers Jupiter has chosen her to contend for a place in the city's most prestigious organization: the Wundrous Society. In order to join, she must compete in four difficult and dangerous trials against hundreds of other children, each boasting an extraordinary talent that sets them apart--an extraordinary talent that Morrigan insists she does not have. 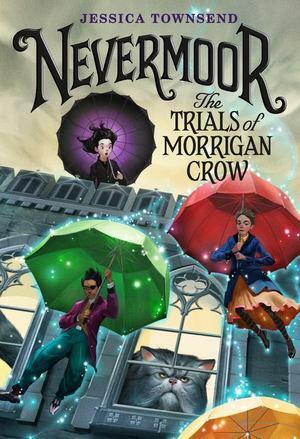 To stay in the safety of Nevermoor for good, Morrigan will need to find a way to pass the tests--or she'll have to leave the city to confront her deadly fate. Perfect for fans of the Harry Potter series and Neil Gaiman, this fast-paced plot and imaginative world has a fresh new take on magic that will appeal to a new generation of readers.